In ancient mythology, the sphinx embodies an amalgam of human, lion, and hawk body parts. The subject of this watercolor by Auguste Rodin, titled Sphinx, doesn't literally represent such a beast. Instead, the artist drew a young woman, who is standing frontally, with her arms folded. 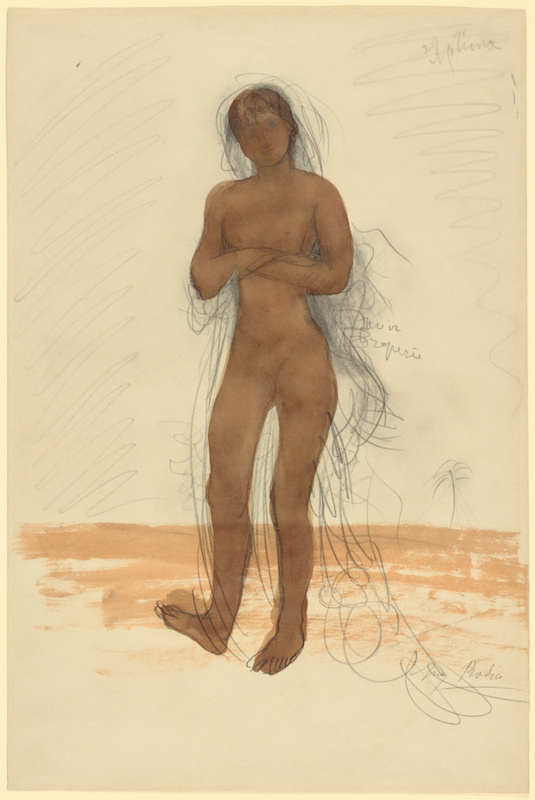 Rodin made this drawing late in his life, during a period of prodigious output. As is common in those drawings, sketchy pentimento lines appear to suggest a figure in motion. Here, though, the scribbly pencil marks may indicate that the model was partially clothed, because of the artist's inscription, "noir draperie" (black drapery). Rodin usually sketched his models without taking his eyes off the figure or looking down at the sheet of paper. In this case, the artist first incised the figure's silhouette--notably the hips and elbows--before using the pencil or the brush. Although the figure appears hastily sketched, the drawing as a whole reflects Rodin's considerable abilities as a draftsman. Details, such as the model's perfectly turned right ankle and knee, belie his considerable skills of observation. Carefully applied watercolor washes reveal Rodin's mastery of technique. Like many nineteenth-century artists, Rodin was interested in exotic subjects. Subtle clues, such as sand beneath the woman's feet and a palm tree on the horizon imply that, like the Great Sphinx of Giza, this woman is set in a time-forgotten, romanticized place. Rodin's title implies on a metaphorical level that she--or "woman" more generally--is like the sphinx, an enigmatic creature.